EDIT: LOBH reports that exact sales figure is currently at over 230,829 copies sold. To see the source, head over here. In other news, Switchfoot is set to return for the San Diego County Fair (formerly the Del Mar Fair). This will be the fourth time in the last five years the band has graced their hometown's fair. LINK for details and more. In other San Diego news, Switchfoot is mentioned in North Count Times' Year in Review article, which you can read here. 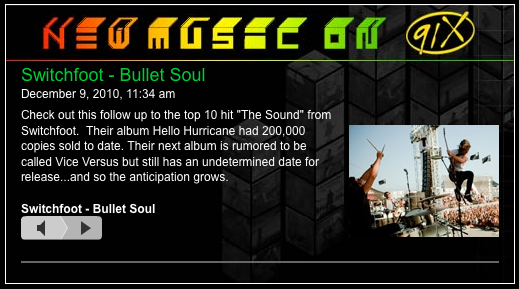 Ok, last item today, Buzz 103 in South Florida posted their interview with Switchfoot during the Buzz Bakesale a couple weeks back. It's worth listening to, as the band talk about their year as well as jokingly discussing a possible box set of unreleased Switchfoot songs, sponsored by Fed Ex. In site news, be sure to be on the look-out for our Year-In-Review/What to look forward to in 2011 post, which should be coming out on the first day of 2011. PEACE! Then, it's on to "Vice Verses!" As far as album sales go, nowadays, how does this compare? I know that album sales are down significantly. Is 200K sold equivalent to maybe 500K sold 5 years ago? Do you follow my analogy? The industry opinions really vary. I've heard some people say 50K is the new gold standard these days. For me, I'd say 200K is pretty close to where Gold was back in 2005. 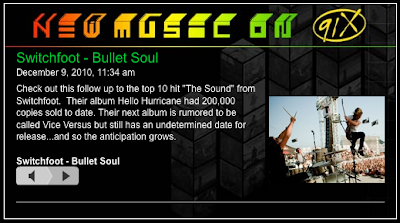 So I'm thinking, adjusting for the downturn in album sales, "Hello Hurricane" has reached AT LEAST "Nothing Is Sound" status.